The ice dance recap post from Worlds is coming, I swear. It’s just been a difficult patch for me lately as I’m trying to stay afloat mentally in my life. Admittedly, this rough patch is more than just stress and I’m doing my best to make sure that I stay in a good state of mind, so thank you so much for your ongoing patience and support. I really do appreciate all your comments on the blog and on Twitter. 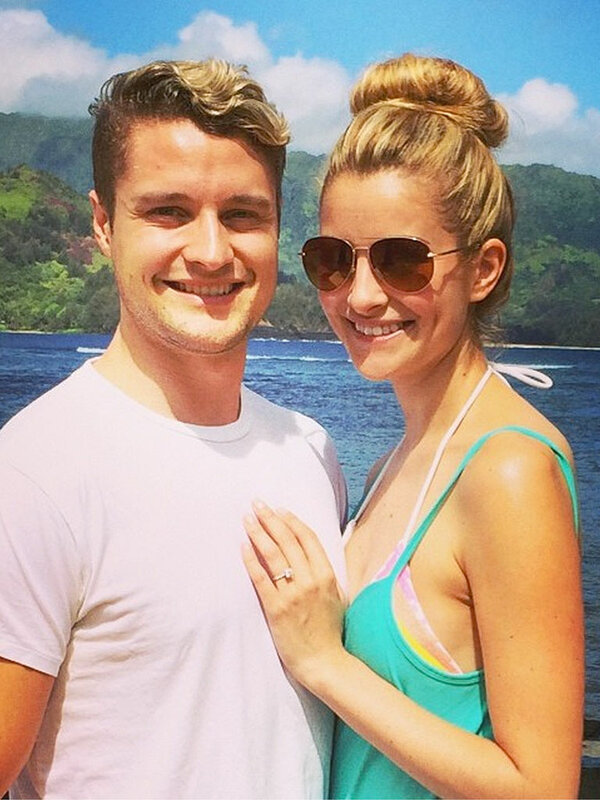 While you’re waiting for the Worlds ice dance post, we should celebrate the nuptials of two lovely ice dancers – Tanith Belbin and Charlie White. Congratulations to the lovely couple! People magazine took some gorgeous photos of Tanith and her wedding dress and she looks flawless. For the photos and the article, click here~! What do you think of Tanith’s dress? Now that I have had a little time to digest the events of Worlds this year, I somehow just realized that this field is the one with the most veterans staying behind right after the Olympics. As a result, the competition itself didn’t seem to mediocre this season and I was also able to predict the podium with a good degree of accuracy. 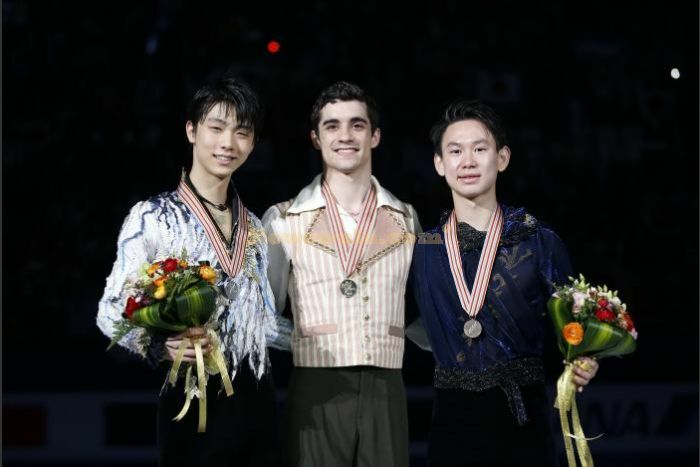 For Javier Fernandez, this season represented a major milestone for the history of Spanish figure skating and I hope that the sport will flourish, bringing a more diverse and interesting group of competitors for the future. Overall, Fernandez brought two solid skates to Worlds, which in the end, triumphed over his Yuzuru’s less than stellar LP. Nonetheless, as we go into the next season, I still think that Javi needs to be in a “chase” mindset where he should seek constant improvement on many aspects of his skating. In both programs, his footwork was a tad sloppy and at times skated carelessly as if he were randomly flinging his free leg around. Some of his spins in his SP were questionable and despite skating well in the LP, it looked as if he didn’t care very much for the program. This is somewhat understandable – we don’t always relate to a role – but as a performer who is expected to interpret different kinds of music, he should also learn to sell programs that may not be up his alley, as skaters like Meryl Davis & Charlie White have done in the past. In contrast, Javi’s training mate and friend, Yuzuru Hanyu had a bit of a rough time at this competition. Despite skating perhaps the best iteration of his SP, Yuzuru fell at the beginning of his LP and doubled a few jumps here and there, which cost him a lot of points. His saving grace at this competition was likely his PCS but compared to Javi, Yuzuru fought hard to salvage his program and committed to his performance. It also helps that his choreography, although unfortunately set to the Phantom of the Opera, aided him in showing off his skating skills and polish. All in all, I think Yuzuru performed admirably in light of all the health issues he’s had this season. On a side note, I absolutely adore Yuzuru and Javi’s relationship with each other as friends as well as rivals. Even after a tough performance, it was really adorable that Yuzuru cheered loudly for Javi in the kiss and cry. While Fernandez is writing the start of figure skating at the elite level for Spain, I think Denis Ten is doing the same for Kazakhstan. Yes, Ten did win bronze at the Olympics but I think that it could be very possible that we see Denis at the top of the World podium one day. In the past, I have admittedly written off Ten in my predictions despite being talented purely on the basis of his inconsistency. This season, however, Denis has shown us that he can muster up solid or even clean skates when the need arises. Lori Nichol is also crafting some very lovely programs for Denis – some in the style of Patrick Chan, though his LP this year packages Denis really well with all of the intricate footwork and choreography which we now know he is capable of, and with a touch of Denis’ heritage and culture. If this is what Denis Ten will be like in the future, I look forward to seeing more of his skating. The Russian windmills (Voronov and Kovtun) imploded in different segments of the competition, thereby assuring my sanity for this season at least. Friend and reader Ay-sa were contemplating the horrific possibility of them winning Worlds this year and did not have anything pleasant to say about it. My heart goes out to Han Yan who positively buckled under the pressure in his LP. His nerves were already showing in his SP where he skated tentatively (the skate itself was decent though with a few minor bobbles) but he completely imploded in the LP. I feel terrible because he reminds me a bit of Takahiko Kozuka – shy, talented and with tons of potential but he will need a lot of work. Speaking of Kozuka, he is not even on my radar these days. Poor chap, finishing in 12th. Misha Ge. I’m not sure what to make of this guy. Firstly, does anyone have any idea about the reasoning behind his costume for his LP? Secondly, I want to like his smooth, graceful style though by the end, his windmill arm step sequence elicited a visceral anger from my unconscious brain. I’ve learned to like Jason Brown a bit more after this competition but I really hope that his choreographer gives him less kitschier programs next season. All in all, I think it was a pretty good competition. What did you think of the podium and the performances? I’d love to hear from you!